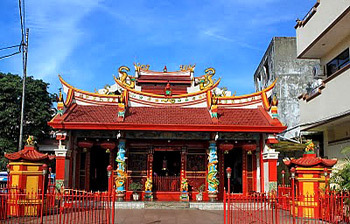 Temple, which built in the early of 19century, is one of some believer place of worship Buddha Tri Dharma temples in Manado city. This temple, which is the eldest temple in Indonesia east area, has China architecture and nuance typical in 19century, and located in downtown area. In every February, for 'Imlek' agenda (China New Year) in this temple is passed off ceremony ritual "Tapikong" (Toh Peh Kong). The top moment is traditional cortege China parade, a real unique, attractive, and interesting with main attractions of Barongsai dance and Tan Shen (Incen Pia).